November is well known as the gratitude month. I love how people have embraced this idea, sharing daily what they are thankful for on social media. But it doesn’t have to stop there. Gratitude is an attitude we can adopt year round. 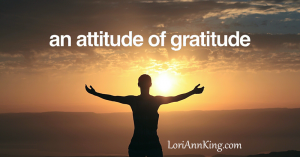 Gratitude was one of the tools I used to change my thoughts from negative to positive as I worked to find balanced wellness after surgical menopause. My new book, Come Back Strong, is due out mid-December. Here is an excerpt about how gratitude can put things into perspective and help us focus on the positive. As I mentioned earlier, I use BHRT to manage my symptoms. Once a month, I stop using it per my doctor’s instructions. When my symptoms reappear, mainly hot flashes and night sweats, I start again. There are times where my menopausal symptoms are worse than others. Feeling sorry for myself doesn’t help me. Instead of continuing down a road of com-plaining, whining, and blaming, I start praising and counting my blessings. I commit myself to an attitude of gratitude and I transform my world. What am I grateful for in this moment? What do I want to remember? The benefits of gratitude are highest when I ex-press it daily in writing. Every day I write down three new things that I am grateful for. In the past, I’ve done this in a journal and reviewed it often. I’ve also written them on a stack of index cards, so I can flash through them several times a day. I include wonderful things that I observed or experienced in the past twenty-four hours. As I focus on the positive, how I perceive the world around me changes. Here are some grateful thoughts that you could practice thinking or say out loud to get started. Invent more. Attitude combined with the right perspective reminds us to be grateful and live in the solution, instead of staying stuck in our problems. When I fight with a loved one, I remember that my friend Lauren’s brother literally fought for his life after a motorcycle accident that ultimately would take his arm and leg. I am grateful for my limbs. When I struggle with hot flashes, night sweats, insomnia, brain fog, or other menopausal symptoms, I remember that my friend Jackie lost her fifteen-year-old daughter to cancer. I am grateful for my life. While I was writing this book, my cousin Kim lost her battle with brain cancer. Her husband, son, mom, sister, family, and friends would all give just about anything to have one more day with her. We don’t have to lose a loved one to appreciate life. A simple way to feel more gratitude is to read an obituary daily and ask yourself, “What would this person give to have one more day?” My point is, we don’t have to stop living until our condition has resolved. We can simply be unimpressed by it. There is a story in the Bible about the apostle Paul and the thorn in his flesh. It doesn’t say if it was physical. We just know Paul saw it as a form of pain. Paul asked God three times to remove the thorn and was denied, learning grace and strength in the process.Don’t we do the same? We think we could be more effective or productive without an ailment or symptom. We wait until we feel good before we step into our purpose or passion or greatness. What if the goal is to live with joy despite our challenges? Despite surgical menopause? What if we are to live on purpose despite the thorns in our lives and how they manifest for us? Everybody has experienced a thorn in her side at some point. 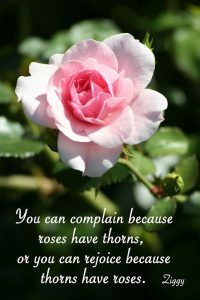 The question is, what is your attitude toward your thorn? Wishing you a Thanksgiving filled with true health, love, laughter, and freedom! Very nice post, Lori. I enjoyed the book excerpt.